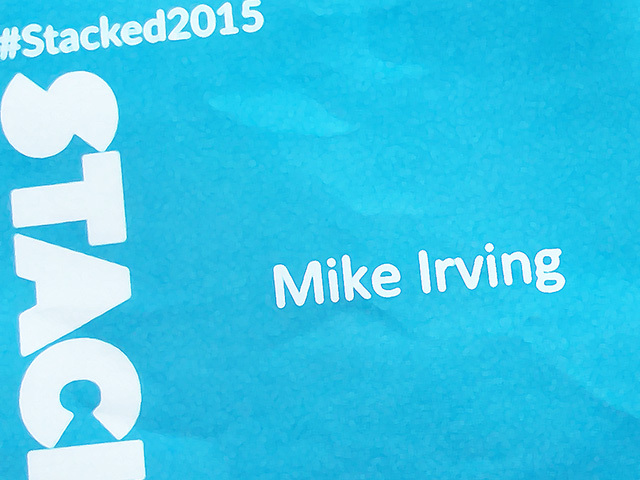 Last Wednesday I was at the Stacked Conference for Windows Developers, in Manchester. It was brilliant to have such an event up in the North West, and the venue, The Comedy Store at Deansgate Locks, was a great choice. Although not officially a Microsoft event, many of the speakers we're from Microsoft, and alongside the other sponsors, Mando and DevExpress, helped create a fantastic day. The Morning Sessions we're from Mike Taulty and Jeff Burtoft, and focussed on the Universal Windows Platform (UWP) and the Windows 10 Web Platform, accordingly. Watching Mike control a Sphero Robotic Ball via a UWP App on Desktop, Phone, Raspberry Pi, via Touch, Voice and Xbox Controller, was captivating for the audience. Before the lunch break, Jonathan Seal then joined Mike Taulty to discuss Making Computing More Personal. The food, Curry, was most welcome by the large number of attending developers! After Lunch, Mary Jo Foley, a career-long Microsoft journalist, held an open dicussion on Microsoft Now and Next. Martin Beeby, another Microsoft Developer Evangelist, closed the show discussing Developing for IoT (the Internet of Things). The show was very well organised, and was closed, as it was started, by Gary Pretty from Mando. After an evening break, Mary Jo Foley returned to the stage with Paul Thurrott to record the Windows Weekly show, live from Manchester. I love going to developer shows. I learn things. I discover new technologies. But most of all, I meet fellow developers and techie people. Whilst I love travelling to events, often in London, having such a high-profile, and well managed, event in Manchester is amazing, and something I'd love to see more of in the future.